CLICK HERE to check out the rest of Matt Powers’ videos on his Vimeo channel. Long Beach, Calif. – July 23, 2011 – Formula DRIFT returned to Evergreen Speedway for Round 5: Throwdown. Daijiro Yoshihara in the Discount Tire / Falken Nissan S13 takes the victory and the lead in the overall Pro Championship points standings. Attendance records were broken as the event reached capacity for the venue. Round 5: Throwdown reached capacity as fans came in droves to Evergreen Speedway. Attendance was up over 10% from last season continuing the increase in numbers for the Series. Fans were treated to an exciting round of action from the top drivers in the sport. The competition heated up with the final four drivers aiming to move closer in their chase for the championship. Fredric Aasbo in the Need For Speed / Scion Racing TC went head to head with Rhys Millen in the Red Bull / Hankook Hyundai Genesis Coupe and edged out the former champion earning third place. 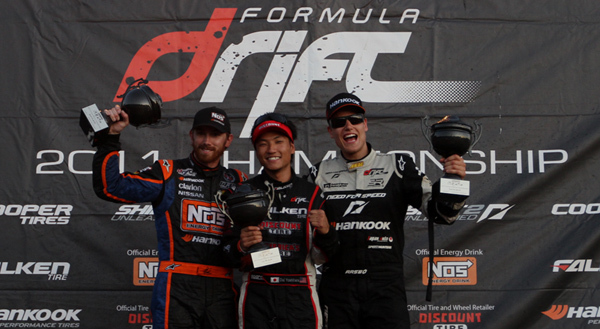 The Finals matched up the 2009 champion, Chris Forsberg in the NOS Energy Drink / Hankook Nissan 370Z with Daijiro Yoshihara. Yoshihara took the victory and gained the lead in the Pro Championship point standings and remains the leader with a commanding lead in the Tires.com Triple Crown bonus. The Formula DRIFT Championship continues for Round 6: After Dark at the Las Vegas Motor Speedway on August 26 – 27. Tickets are available to purchase online.